We have already covered the Windows Live Facebook plugin today which made it possible to upload photos from the Windows Live Photo Gallery application directly to Facebook. 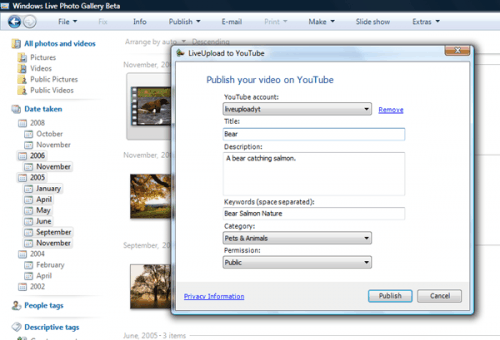 The Live Upload To Youtube plugin is a similar plugin by the same author with the difference that it provides the option to upload videos to Youtube directly from within Live applications. To be more precise, the plugin is currently working with Windows Live Photo Gallery or Windows Live Movie Maker. It works by selecting one video in one of the supported applications and initiating the upload from the Publish > Live Upload To Youtube menu. A popup will appear asking for a Youtube username and password. If the login is successfully a new window will be shown with options to enter a title, description, keywords, a category and permissions for that video. A progress bar will be displayed after sending the information that is showing the status of the uploaded video. The Windows Live Movie Maker menu is called Publish On Web instead of Publish but it provides the same interface after that point.